Lorna Hill Podiatry based in Babbacombe, Torquay offers a full and comprehensive range of podiatry treatments for any condition affecting the lower limb and foot, whether it’s general foot care, plantar fasciitis, nail surgery, nail care, diagnosis of skin problems, pain therapy, corns, calluses, athlete’s foot or any other foot issues. Are you concerned about Plantar Fasciitis? Call us on 01803 323229 for a consultation. In need of treatment for athlete’s foot? Call us on 01803 323229 for a consultation. Do you need diagnosis of a skin problem? Call us on 01803 323229 for a consultation. We are an HCPC registered chiropody and podiatry clinic based in Babbacombe, Torquay. Are you suffering from foot pain? Do you have diabetes and need regular foot care? Have you got painful corns, calluses or verrucas? Do you have ingrowing toenails? If you answered ‘Yes’ to any of these questions, then you should contact Lorna Hill Chiropodist & Podiatrist who provides top quality chiropody & podiatry services to clients of all ages in Babbacombe & the surrounding areas. Our focus is always on giving the best possible treatment outcomes for all our patients within a comfortable, clean, clinical environment. For more information call us on 01803 323229, email lornahillpodiatry@gmail.com or pop into the clinic at 151 Reddenhill Road, Torquay. 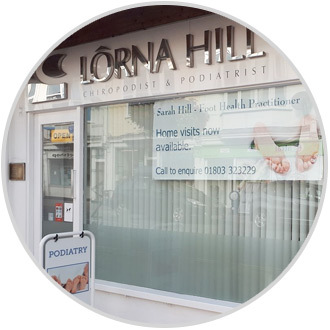 Why choose Lorna Hill Podiatry? We offer a ‘Home Visiting Service’ for customers unable to attend the clinic for appointments. Sarah Hill is a fully trained, qualified & insured Foot Health Practitioner who graduated with the Stonebridge Institute. Sarah offers either a ‘nail cut only’ service or a full foot consultation including treatment of corns, callus, fungal nail, nail trimming.